Overall &lsqb;w&rsqb; 135cm / 53" &lsqb;d&rsqb; 90cm / 35.5" &lsqb;h&rsqb; 104cm / 41"
Seat &lsqb;w&rsqb; 105.5cm / 41.5" &lsqb;d&rsqb; 51cm / 20" &lsqb;h&rsqb; 49cm / 19.5"
Overall &lsqb;w&rsqb; 140cm / 55" &lsqb;d&rsqb; 92.5cm / 36.5" &lsqb;h&rsqb; 108cm / 42.5"
Seat &lsqb;w&rsqb; 110.5cm / 43.5" &lsqb;d&rsqb; 53.5cm / 21" &lsqb;h&rsqb; 49cm / 19.5"
Overall &lsqb;w&rsqb; 189cm / 74.5" &lsqb;d&rsqb; 90cm / 35.5" &lsqb;h&rsqb; 104cm / 41"
Seat &lsqb;w&rsqb; 159.5cm / 63" &lsqb;d&rsqb; 51cm / 20" &lsqb;h&rsqb; 49cm / 19.5"
Overall &lsqb;w&rsqb; 196.5cm / 77.5" &lsqb;d&rsqb; 92.5cm / 36.5" &lsqb;h&rsqb; 108cm / 42.5"
Seat &lsqb;w&rsqb; 167cm / 66" &lsqb;d&rsqb; 53.5cm / 21" &lsqb;h&rsqb; 49cm / 19.5"
The popular Lynton suite is also available with Dark Beech or Light Oak knuckles. These stylish wooden arms are complemented by a soft, comfortable ‘chaise’ seat and a welcoming buttoned fibre-filled back cushion. 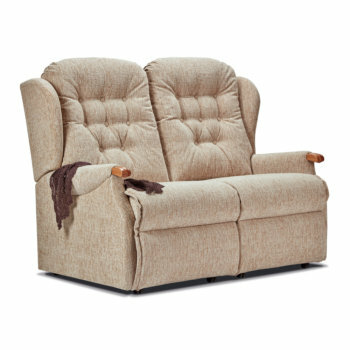 Suite options for this model include; fixed or reclining two and three seat settees and fixed or reclining individual chairs. Individual chairs, recliners and two and three seat settees available in small and standard sizes, individual recliners also available in larger royale size. Available with a manual or powered reclining action or even rechargeable powered if trailing cables are a problem with positioning in the room.